Happy New Year friends! Here at the Studio, we’re dusting off the Holiday glitter, cleaning up the winter greens, packing up the ornaments, and preparing for another amazing year. As we reflect on 2014, a few magical moments stand out in our minds and we wanted to share them with you. In February of 2014, we were lucky enough to take part in the wedding of Carrie and Alex Brophy which took place in our event space, Pennway Place. 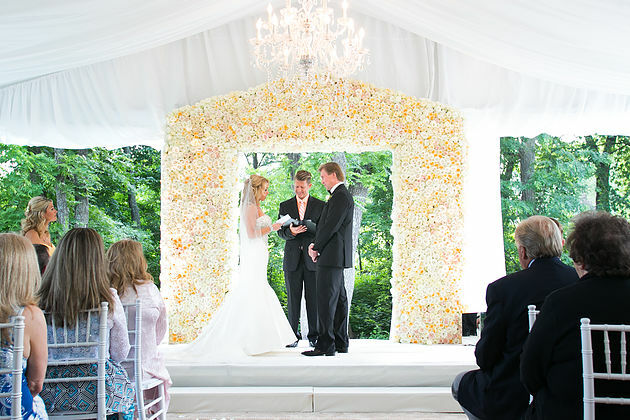 The couple was married in front of a beautiful alter that featured a unique styling of hanging orb vases filled with gorgeous flowers. Their cake was surrounded by glass towers with floating candles, and the lighting throughout the space created an elegant and intimate setting. In June, we had the pleasure of creating a custom altar piece for the wedding of Jenn and David Selph. The couple was married in their front yard and this beautiful arch was the focal point for the ceremony. The arch itself took two days to create, over 1,000 roses, and the teamwork of our amazing Designers who worked into the night to complete this beauty. Although it was difficult to transport, very heavy and extremely delicate, our team is still very proud of this creation! In September we teamed up with our friends at Bishop-McCann and Halls Kansas City to celebrate the opening of the brand new Halls store on Grand. The entire ‘Reimagine’ campaign was extensive, detailed, and an overall over-the-top production! Complete with a stunning red carpet entrance, florals throughout the new store, a fashion show for guests, and a Las Vegas style after-party! The after-party was our main focus and we spent five days transforming the old Halls Men’s store at Crown Center into a true nightclub. The ceiling featured custom built light boxes, the room was filled with lounge areas and tables, custom walls surrounded the room and the dance floor was flanked with a curved screen that featured a Kansas City themed video projection piece created by VJ Second Nature. We were so honored to be part of such a monumental move, and we loved watching our friends from Halls celebrate the Grand Opening Gala by dancing the night away! To end out our year, we spent the last six weeks creating custom home decor for clients throughout Kansas City and the surrounding areas. Complete with mantelpieces, custom wreaths, decorated trees, and lots and lots of garland, the end to 2014 was a beautifully festive one. These images come from some of our favorite in-home set ups. As we step into the new year, we are beyond excited to push the boundaries of creativity while simultaneously setting TRENDS for 2015 and for the Kansas City design scene. Our hope is to inspire others in every facet of their lives; within style, home decor, color palettes, floral choices, and party needs. 2015 will be a great year, so don’t forget to keep checking back to see what new and exciting things are unfolding.